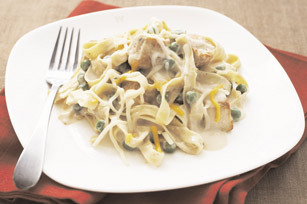 Make this Creamy Chicken and Peas Noodle Recipe for a delicious and hearty weeknight entrée. There's no need to wait on a chicken casserole to bake when you have this Creamy Chicken and Peas Noodle Recipe that cooks in 25 minutes! Cook noodles in medium saucepan as directed on package. Meanwhile, cook chicken in medium nonstick skillet sprayed with cooking spray on medium-high heat 5 min. or until done, stirring occasionally. Add Neufchatel and milk; cook and stir 1 to 2 min. or until Neufchatel is melted and mixture is well blended. Add soup and peas; cook 5 min., stirring occasionally. Drain noodles; return to saucepan. Add chicken mixture and half the shredded cheese; cook until cheese is melted and mixture is well blended. Sprinkle with remaining cheese. Using reduced-fat products helps to lower the fat content of this indulgent recipe. Prepare using whatever KRAFT Shredded Cheese you have on hand, such as Cheddar, Mozzarella or Monterey Jack. Substitute frozen chopped broccoli or your favorite blend of frozen mixed vegetables for the peas.